Call for CBD Linear Parks | Whitehorse Active Transport Action Group Inc. 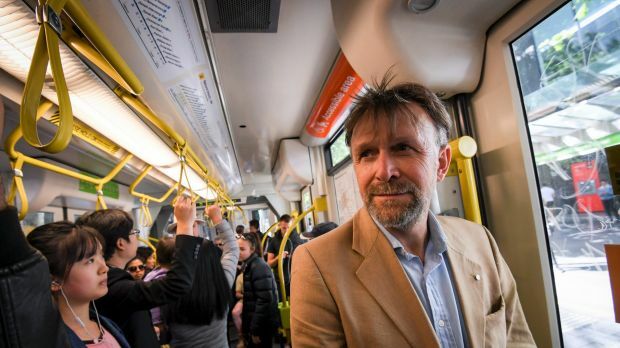 Many CBD roads should be ripped up and converted into “linear parks”, bike paths and tram lines if Melbourne wants to keep its title as the world’s most liveable city, says the council’s new transport chairman. And a rail link to the airport also needs to be made a priority, says Nicolas Frances Gilley​, who has been the council’s transport chair since March. As the council prepares to update its transport strategy next year, Cr Frances Gilley has outlined his personal view of where the city should head. By 2036, the Melbourne council area is tipped to host 1.4 million residents, workers and visitors each day – up from 922,000 now. In his Transport Vision for Melbourne, the councillor argues that more space is needed for people and “less for cars”, if Melbourne is to keep its most-liveable-city title. This means more roads dedicated to trams, separated bike lanes and space for walking, Cr Frances Gilley said. “The city will be greener, quieter and shadier in summer and a delight to live and work in,” he writes. Cr Frances Gilley has pledged to walk, cycle or use public transport to travel to work every day. But he has backed the North East Link – a proposed toll road linking the Metropolitan Ring Road in Greensborough to either the Eastern Freeway in Bulleen, or EastLink. “If we don’t enable vehicles to travel around the city, and they keep coming through, we’re never going to be a liveable city,” he said. Yet he rejects the government’s proposed $5.5 billion West Gate Tunnel, arguing it would see traffic spike in the city. Cr Frances Gilley said the government’s failure to offer a transport strategy had let Transurban’s unsolicited bid for the West Gate Tunnel become Victoria’s priority infrastructure project. Increase rail services from regional centres, a high-speed rail corridor to Sydney and high-speed radial bus routes to fill in gaps in the public transport network. A spokeswoman for Public Transport Minister Jacinta Allan said the Andrews government was “making the biggest investment in transport infrastructure in Victoria’s history to benefit passengers, motorists, pedestrians and cyclists”.